Fully supported by all VUE DSP-enabled products: Every VUE DSP-enabled loudspeaker and VURDrive systems engines rack mount dsp amplifier includes SystemVUE capabilities already onboard. Intuitive user interface: SystemVUE Software brings practical, real-world functionality within easy reach. Easy device discovery: Quickly identifies all connected VUE products using standard and reliable IP based DHCP protocols. Zero configuration networking: Simply plug in, and the product automatically connects to virtually any kind of IP configuration. Fully compatible: Mac (OSX 10.7 – Mac Os 10.12) and Windows (W7 32 and 64 bit – Windows 10) compatible, iPad (iOS 10). Easy access to network and device-level parameters: Speaker protection, input/output levels, volume, mute, delay and input sources. 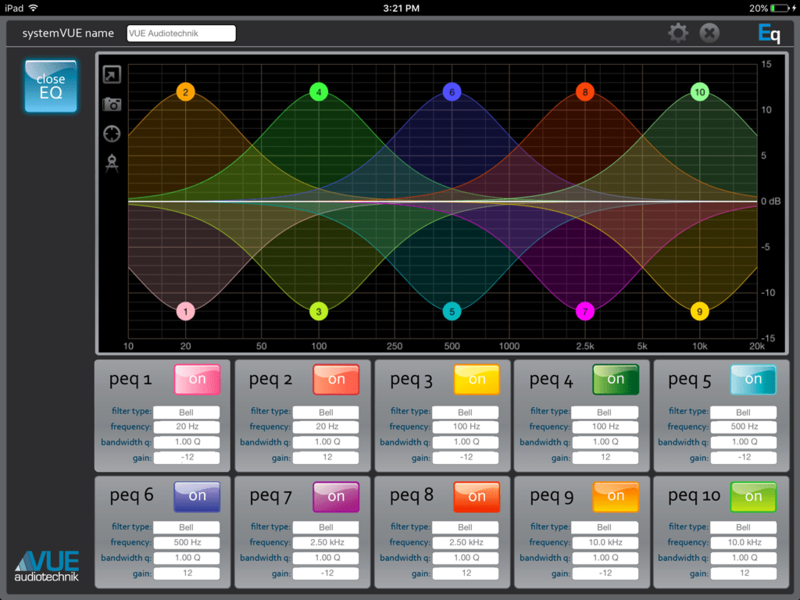 Free and available now: Download the Free SystemVUE Software for Mac and Windows and through the Apple App Store for iPad and iOS 10. SystemVUE networking technology connects all VUE DSP-enabled products to a Windows or Macintosh computer via a wired or wireless Ethernet connection (see specifications pg. 4). Once connected, the companion SystemVUE Software allows users to access any single product, or entire networks of them, through a highly intuitive user interface. 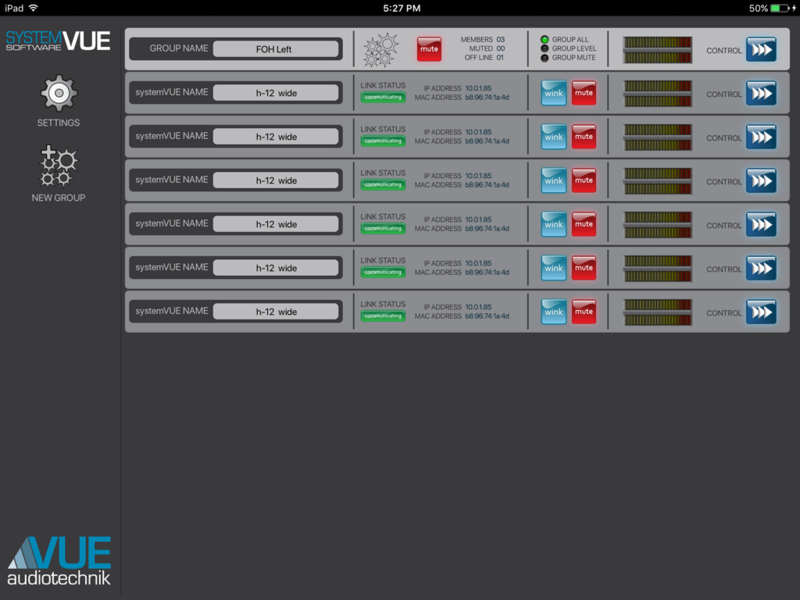 Device and network-specific windows make optimizing and monitoring easy, with controls for input/output levels, volume, mute, delay, input sources and the ability to monitor a broad list of parameters right up front and within easy reach. 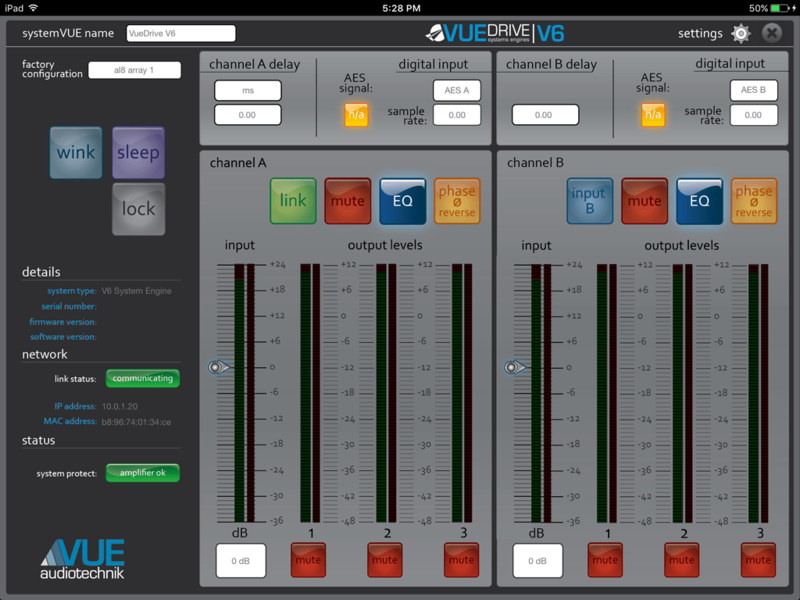 Every VUE DSP-enabled loudspeaker or processor ships with SystemVUE networking capabilities already onboard. There’s no need for additional cards or retrofitting. And since every VUE DSP-based product was designed from the ground up to be part of the SystemVUE network, there’s tremendous synergy at every level. 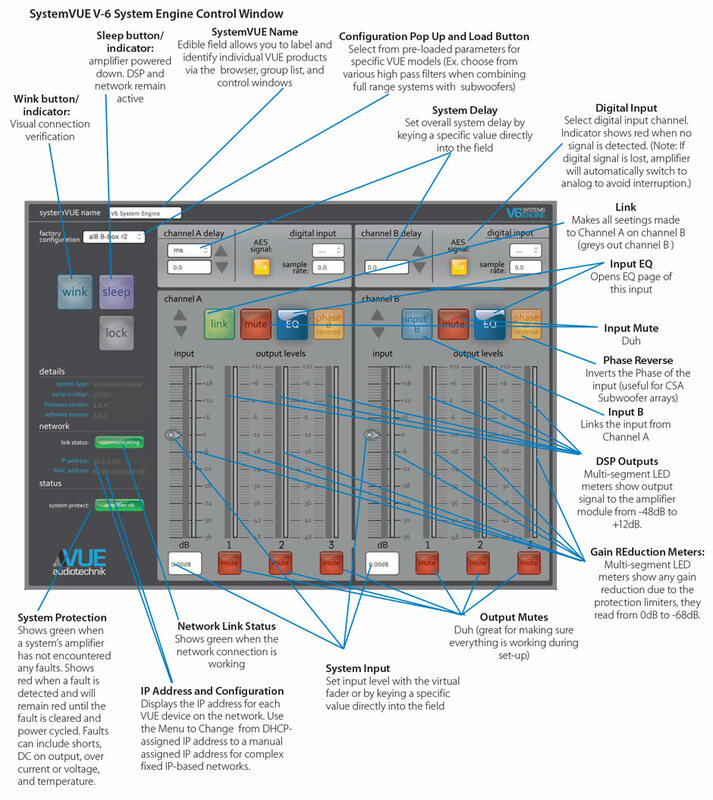 From transducers, amplifiers and DSP, all the way out to the SystemVUE Software, everything works in perfect harmony to enable precise control and easy operation. To make set-up easy, SystemVUE automatically creates a usable TCP/IP-based network without requiring manual operator intervention or special configuration servers. This means that any VUE DSP-enabled system will automatically recognize and connect to virtually any kind of IP configuration including DHCP-based networks, a fixed IP network, or even an ad hoc network (directly connecting to a computer via Ethernet cable). Whatever the configuration, just plug in and the devices are instantly recognized. It just works. Most importantly, SystemVUE Software was designed with significant input from installers and system integrators. So unlike other applications that were developed from the perspective of the DSP or electronics engineer, SystemVUE Software takes a practical, real-world approach and puts the most critical functions right up front and within easy reach. The network browser window shows all VUE systems available on the network as well as an overview of their current status. It also allows users to create, monitor, and select groups. SystemVUE groups can greatly simply controlling larger arrays and systems. Once you have created a new group you can add members and elect what functions the group will control. For example you can make a group of all the elements in a line array and as a group delay them to time align them with subwoofers. Or you could create mute groups that allow you to turn off sections of the system with a single button. Group functions are maintained int he software and are independent of the firmware running on the actual devices. Network Control is not an after thought! All h-Class systems and the V4 System Engine (DSP/amplifier) ship with networking monitoring and control capabilities already onboard. Unlike competing products in this category all VUE DSP-based systems are designed from the beginning to be network-enabled. There’s no need for additional cards or retrofitting, and every model is optimized for easy configuration with other h-Class and al-Class models via the SystemVUE software. For more information and to download the latest version of SystemVUE go to the Software & Support Page.